Why is too much sun bad for you and how does sunscreen work? Sunscreen is essential no matter what kind of skin you have. (Image: Mark Goebel). We all know that a tan or sunburn is a sign of damaged skin, and using sunscreen or sunblock is a normal and important part of modern life. Of course, some sun exposure is good for us as it helps our bodies produce vitamin D, which aids calcium absorption and keeps our bones strong. Current medical advice is to spend no longer than 10-15 minutes in the sun without sunscreen, as this is believed to maximise vitamin D production while minimising the risk of skin damage. The reason that too much sunlight damages our skin is very simple: it’s radiation. Called ultraviolet radiation, there are 3 kinds that we need to be aware of. Approximately 90% of the sunlight that reaches the Earth’s surface is UV-A, which penetrates deep into the skin, damaging cells and increasing the likelihood of cancer. The remaining 10% that reaches us is UV-B and doesn’t penetrate the skin as deeply, so the damage it causes is visible to the naked eye as a tan or sunburn. A tan occurs because the ravaged cells release extra pigmentation in an attempt to defend against further harm from the radiation, causing the skin to change colour. A sunburn is an even more visible sign of the harm done to the cells, as the skin blisters and sheds its upper layers. Because of this damage, UV-B rays can also cause skin cancer. 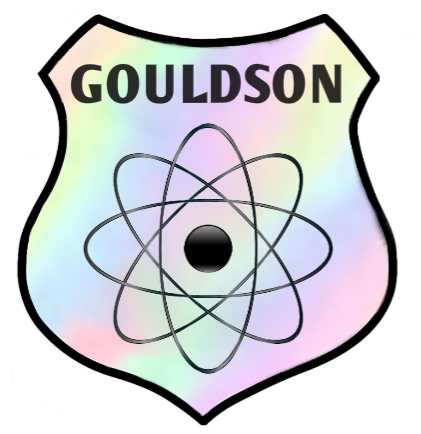 UV-C radiation is absorbed by the Earth’s atmosphere and never reaches us at all. 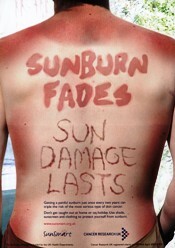 A poster from the charity Cancer Research UK, highlighting the danger of sunburn. Because of the harm that ultraviolet radiation can do to our skin, we need to protect it once we’ve exceeded the recommended 10-15 minutes in the sun. This is true whatever your skin colour; although dark skin doesn’t burn as easily as pale skin it is still susceptible to damage from UV radiation. An easy way to help protect skin is by covering it with clothing such as long-sleeved shirts or trousers; darker coloured fabric offers more protection than light colours. However it’s worth remembering that if you can see light through the fabric, then UV rays can penetrate it so its protection will be limited. Some companies now make clothing with a special coating that absorbs the UV rays and prevents them reaching the skin. Sunscreen and sunblock (they’re generally different names for the same product) are also a good way of helping to protect our skin. Some of the molecules in the lotion absorb ultraviolet radiation and release it as heat, while others reflect it. You’ll have noticed that sunscreens are labelled with an SPF number, which stands for Sun Protection Factor and refers to UV-B radiation. This is because there is no sunscreen (or sunblock) that can prevent 100% of UV rays from penetrating our skin, so the SPF is an indicator of how long it will take for the skin to turn red. If you can usually stay in direct sunlight for 10 minutes without being burned, then a good coating of SPF 15 will allow you to stay in the sun for 15 times longer before burning (15 times 10 minutes is 150 minutes, or two and a half hours). Preventing your skin from burning doesn’t mean that it’s not being damaged though; an SPF factor of 15 will protect against approximately 93% of UV-B radiation, while SPF 50 will give about 97% protection. The subject has applied sunscreen to only half of their face. 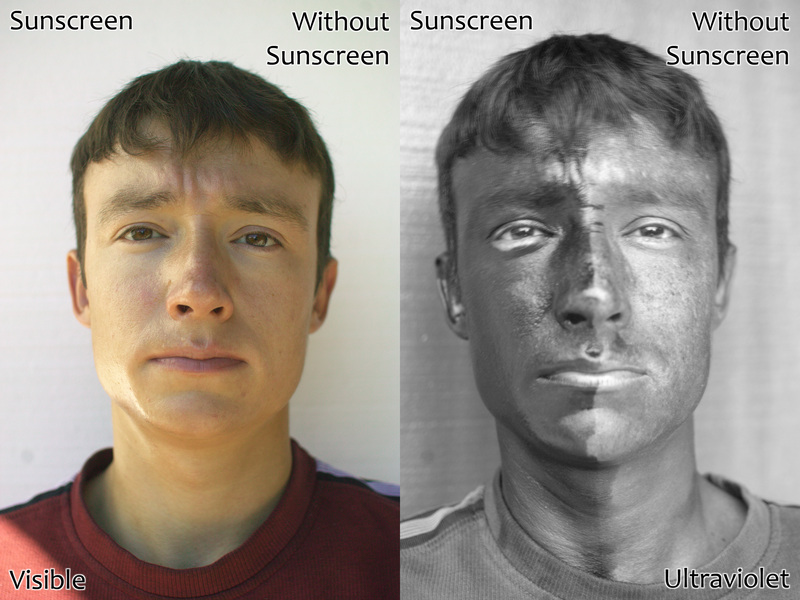 Although the difference is invisible to the naked eye it is clear when viewed under UV light; the sunscreen appears black because the UV rays are unable to penetrate it. (Image credit: unknown). Other ways to prevent skin damage include staying in shaded areas and wearing a hat as well as sunglasses (ultraviolet radiation can damage the eyes as well as the skin). The famous Australian mantra of “Slip, slop, slap” (slip on a shirt, slop on the sunscreen and slap on a hat) is a good way of remembering how best to protect our skin. Please also be aware that tanning beds, booths and sunlamps will harm your skin just as much as too much sunlight; it’s the UV rays that cause the damage, not whether they’re natural or man-made. There is no such thing as a safe tan.